© Jack Snell and re-used under CC BY-ND 2.0 licence. A gazebo? A conservatory? Blurring the line between inside and outside living spaces pulls your home together, and gives you more room for eating, entertaining and just enjoying. And if you can minimise the boundary between indoors and outdoors as far as possible, you are on the road to an illusion of boundless space. The secret to integrating inside and outside lies in relaxed design, organic materials and plants. In this post we’re going to consider conservatories (which bring outdoors indoors) and gazebos (which bring indoors outdoors). Conservatories (and their kissing cousins, orangeries and garden rooms) are such a good staging post between house and garden. If you can blur the boundary as much as possible, then suddenly you will seem to have a much, much bigger space. Some or all of the following points will help. A conservatory that fits with the style of the house. Similar flooring materials and no sudden changes in threshold level to make it hang together well. Similar textures and colours inside and out – plants, pots, containers, trellis work, wallpaper, rattan furniture. A good helping of plants inside: some pot plants, some herbs, a small planted tub on a table at eye level. Provide structure with RHS award of garden merit shrubs and climbers like passion flower, jasmine and gardenia. A feature – such as a pond with fountain or a waterfall – to draw the eye outside. A lighting scheme to highlight outdoor features, extend use of the outdoor space on warm evenings, and make it look wonderful on colder, darker evenings. Most of us are familiar with the pop-up gazebo tent that’s so useful for protection from the sun or light showers in the garden and at festivals. Put an all-weather rattan dining set under a gazebo, if the weather is looking a little uncertain, and you are set for a lovely meal. 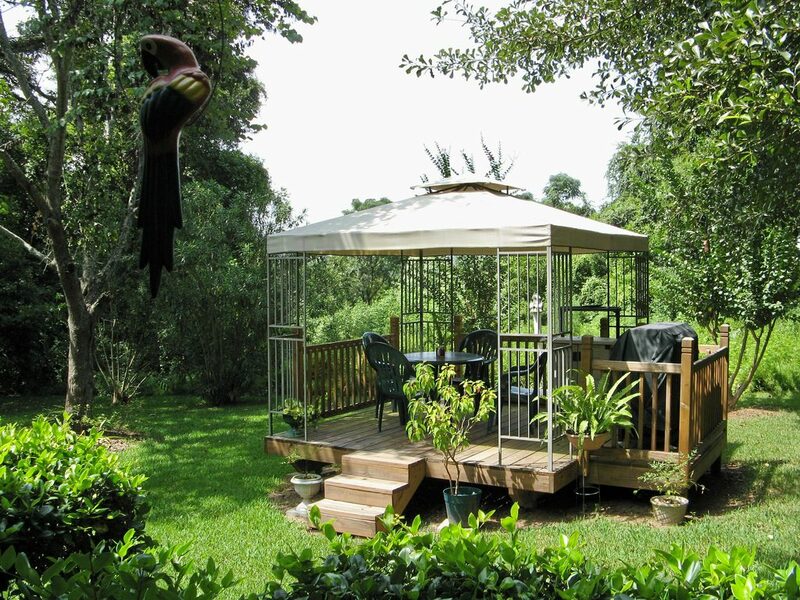 This pop-up gazebo is a descendant of a more permanent structure, often hexagonal or octagonal and either freestanding or built against a garden wall. Think of a bandstand in a public park and you’ve thought of a gazebo. 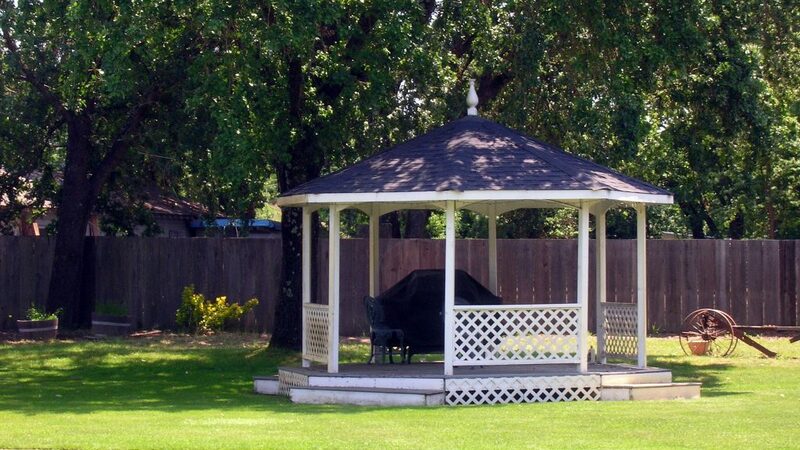 A permanent gazebo is for year-round pleasure. Its purpose is to give as wide a view as possible of the garden or the landscape and so it has open upper walls and is not usually planted up. It has a roof, a raised floor and if it has sides, they are in latticework. It may have bench seats, offering the chance to rest and enjoy looking out. Some gazebos have room for a table and chairs, for a sofa and even for a barbecue. © Randy OHC and re-used under CC BY 2.0 licence. Almost all of us could do with a bit more space at home. Blurring the boundary between the outside and the inside of your home will make it ‘all of a piece’ and give you more room for enjoyment.